Editors Note: The following work was created by by Alex J. ('15) for her pre-calculus class. She explored art on a checker-styled board where she used the Fibonacci sequence to determine the size of each of the boxes. To start off, I was looking at math art on the internet, and that got me thinking about checkerboards. We all know that a checkerboard is a square (lets say 6x6) and then everyone other 1x1 box is colored in. Then I thought to myself, “how cool would it be if rather the boxes weren’t all uniform?” I went online and kept looking for more photos and then I opened a link that referenced the Fibonacci Sequences in art! As seen in the photo below, if you add up the numbers in the Fibonacci sequence, you end up with 1, 1, 2, 3, 5, 8. Now, if we were to have a 10x10 where each 1x1 actually represented 2x2. Then, rather than having 1 block between each box, have 1, 1, 2, 3, 5, 8! But this wasn't satisfying for me, so I thought to myself, “Let’s make the square even bigger”. So now the square will be a 32x32. Also, the spacing between each “line” for each box will be 1,1,2,3,5,8,5,4,2,1,1. Then I thought, what if instead of drawing the regular horizontal and vertical lines I drew the lines on the diagonals! 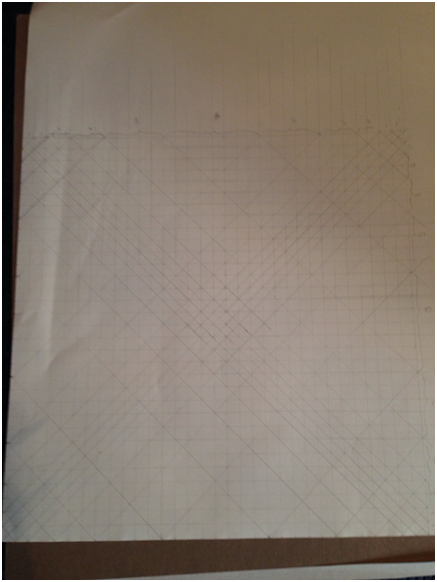 Now that I had all the lines drawn, I followed the same checkerboard pattern of coloring everyone OTHER “box”. If you step back, you might start seeing rounded edges rather than straight ones. Why? Well, if I had made this smaller, or kept adding more of Fibonacci sequence, all the boxes would be forced closer together. Therefore tricking the human eye into thinking the lines are bending.